Every country has its own particular delicacy, and even regional foods within a nation can vary. But the British have some meals and snacks which have universally commonplace ingredients, yet, completely baffle other countries. 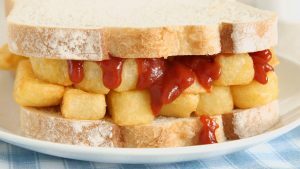 The chip butty, a staple in many households for generations, is causing shock amongst Americans who have only just recently discovered the dish. The chip butty is a quick and simple meal that can be plain, or ‘fancied up’ with tomato sauce, brown sauce, or even a little grated cheese. Everyone has their preference. It can be bought in chip shops, where it is often sold as a ‘chip barm’, ‘chip bap’ or even a ‘chip teacake,’ in some areas of the country. No matter what it is called, the basic premise remains the same. It is bread that has been filled with chips – and it is delicious! What is so confusing about a boiled egg wrapped in sausage meat covered in breadcrumbs? That is all a scotch egg is, and yet it leaves other nations baffled. Admittedly, it is not to everyone’s taste, but it is a delightful snack that goes well in packed lunches and picnics. If you are hungry and you need a little something to eat before your main meal, a scotch egg is perfect.